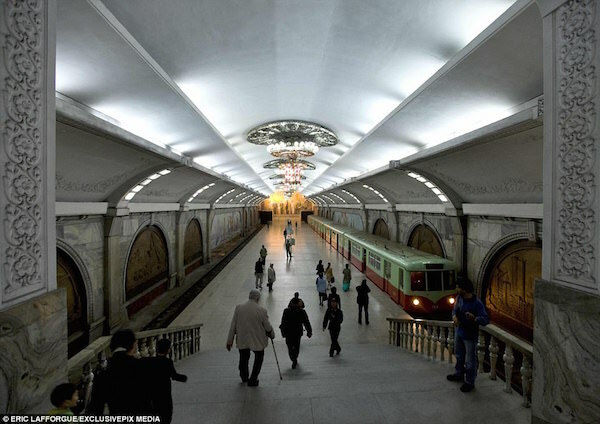 These pictures show the inside of Pyongyang’s 360ft deep metro system – that will double up as a nuclear bunker if war breaks out between North Korea and the US. 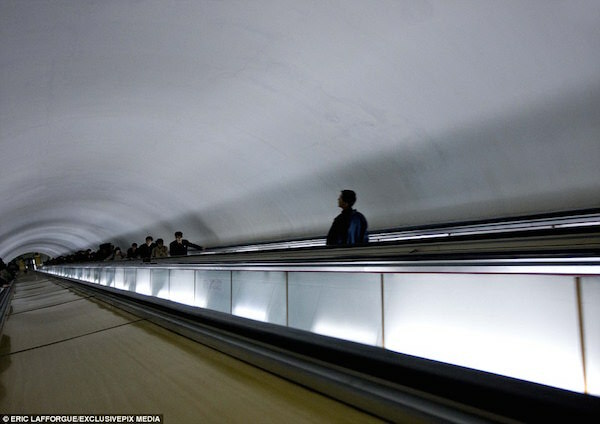 Images show commuters using the world’s deepest underground train system which includes two lines with a combined length of 18 miles beneath North Korea’s capital. 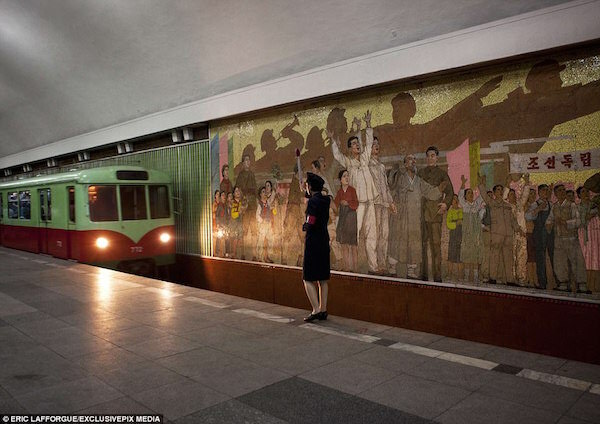 Construction work on the Pyongyang Metro started in 1968 and was inaugurated in 1973 by Kim Il Sung, the grandfather of current dictator Kim Jong-un. 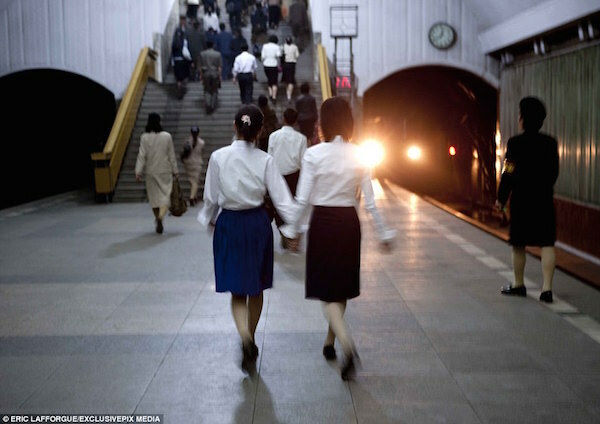 And while it is usually busy with commuters, the depth of the subway system means citizens could also use it as a shelter should tensions between North Korea and America boil over into full-scale war. Earlier this year, one of Kim’s top officials insisted the country was ‘not afraid’ of the prospect of military action by the US. 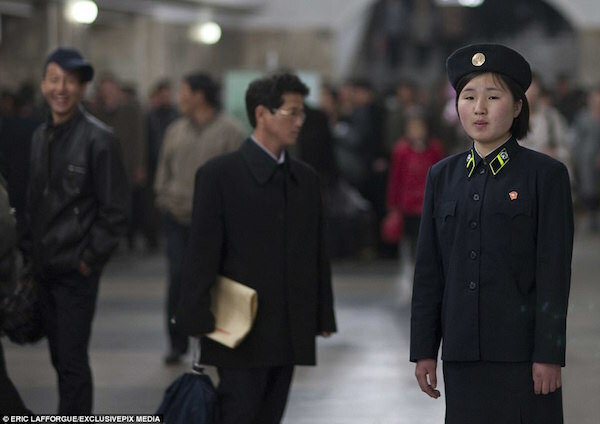 The trains are old carriages from Germany which were bought up by North Korea in 1999 as they were heading for the scrap heap. 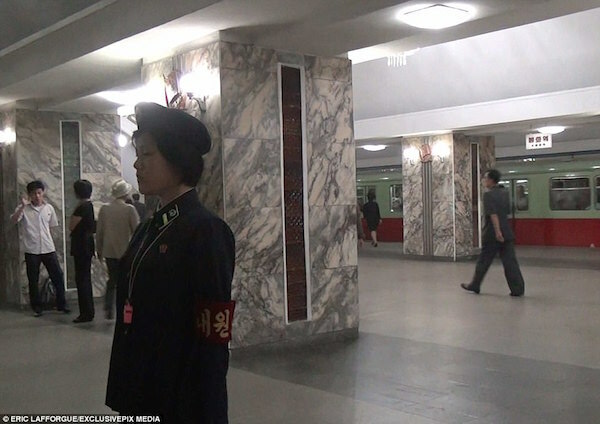 Pyongyang now claims the trains were built in North Korea, but despite attempts to conceal their origin, some old graffiti tags can be seen on the carriages. 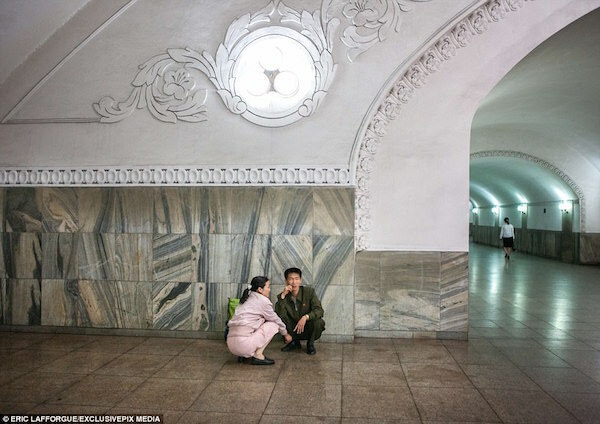 French photographer Eric Lafforgue captured these images during a trip to the hermit state and said there were only 17 stations on two lines. He said the fare was the equivalent of half a US cent. ‘You have to validate your ticket at one of these automatic machines. But they did not work the day I visited. Instead, a train attendant checked was checking the tickets by hand. Like in so many others places, the visits of the Dear Leaders are immortalised by a red billboard telling the date they visited the place,’ Lafforgue added. The pictures come as military officials said today that they plan to move ahead with large-scale U.S.-South Korea exercises later this month that North Korea, now finalising plans to launch a salvo of missiles toward Guam, claims are a rehearsal for war. The exercises are an annual event, but come as Pyongyang says it is readying a plan to fire off four Hwasong-12 missiles toward the tiny island, which is U.S. territory and major military hub. The plan would be sent to leader Kim Jong Un for approval just before or as the U.S.-South Korea drills begin. Called Ulchi-Freedom Guardian, the exercises are expected to run from August 21-31 and involve tens of thousands of American and South Korean troops on the ground and in the sea and air. Washington and Seoul say the exercises are defensive in nature and crucial to maintaining a deterrent against North Korean aggression. The exercises were scheduled well before tensions began to rise over President Donald Trump’s increasingly fiery rhetoric and North Korea’s announcement of the missile plan, which if carried out would be its most provocative launch yet. The heightened military activity on the peninsula this time is a concern because it could increase the possibility of a mishap or an overreaction of some sort by either side that could spin into a more serious escalation. North Korea has been increasingly sensitive to the exercises lately because they reportedly include training for ‘decapitation strikes’ to kill Kim Jong Un and his top lieutenants. Pyongyang is also switching its propaganda machine into high gear by bringing in a large number of foreign journalists to ensure it gets global attention for an event next week in honour of its ruling Kim family on Mount Paektu, a dormant volcano that straddles the Chinese border and is something of a spiritual home for the regime.